2. Using large knife gently cut through herbs until roughly chopped. 3. 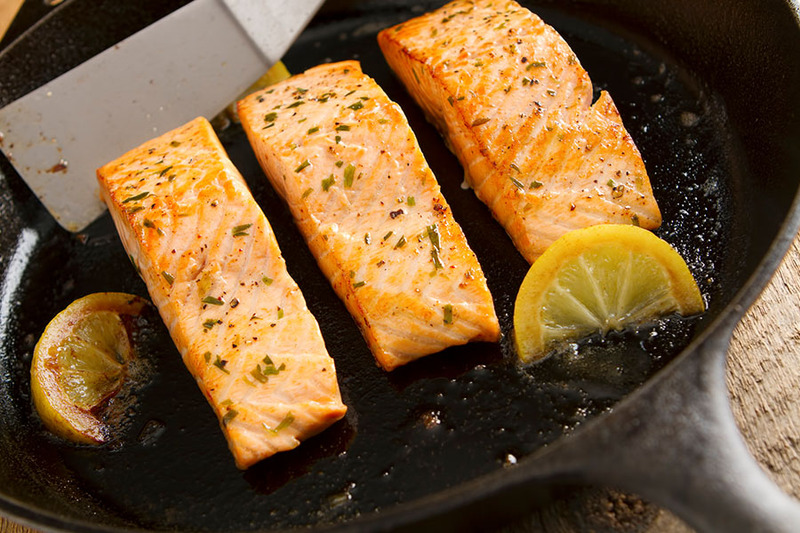 Place salmon on a plate lightly salt and pepper. Take a large nonstick skillet preheated to med high. Add just enough olive oil to cover the bottom, oil will begin to smoke so hold pan off the burner. CAREFULLY lay the salmon fillet in the pan, away from you, flesh side down. Place back on the burner and gently move pan to ensure the salmon does not stick. Cook for about 5 minutes, this is to develop a nice golden color, check by using tongs or a fork to gently lift and look at the color. When to desired color, a little light is ok because it will get a little darker in the oven, use a fish spatula or large flat slotted spatula, gently turn the salmon over. Turn off the burner. 4. Add to the pan the chopped/shaved shallots, chopped herbs and about 2 Tablespoons of Sparrow Lane Tarragon Champagne Vinegar (this will smoke and pop so keep your face back). Place in the pre-heated oven and bake until desired doneness. I like mine a little rare so about 8-10 minutes is good. Cooked all the way through is about 15 minutes. You will feel the flesh becoming firmer the more it cooks. 5. When done, carefully take out of the oven. BE Careful, the vinegar will come out of the oven rather strong so don’t go in head first. Leave it to rest in the pan for a couple minutes, then place on serving platter and decorate with lemons and herbs. I like to add any pan juice over the top and even just a light splash of vinegar to bring out the aromatics. Serve the salt alongside so each can add to their taste. Can be served hot or cold or rewarm it for as needed. Serve on bed of greens, rice or quinoa is yummy too and so healthy.